Here's the quilt I made while we were in Florida...bless its crooked little heart. I wasn't planning on making this quilt. In fact, I almost didn't even take my sewing machine with me to Florida since we were only going to be gone for one month. But I needed to work on a quilt top I'd been putting off for a while...plus I really wasn't sure if I could survive a whole month without sewing something. So I decided to take it...and boy, am I glad I did. The minute we got home from the beach (ok, after dinner, and the kids had a bath and were in bed) I started looking online for fabric. I wanted something bright, colorful and beachy since the fences were slightly drab. It took me about 10 seconds to find Salt Air (by Cosmo Cricket for Moda)...I had seen it a few months before online...long before it was actually in stores--and I remember liking a few of the prints, but I confess I was not in love with all of it, so I pretty much dismissed it. Funny how quickly I changed my tune! I really think it was the perfect fabric for this quilt! For the pattern, I needed something simple and fast so I would actually be able to get it done before it was time to go home! I mocked up a bunch of stuff in EQ, but in the end decided to just get some charm packs, slap a border around them and sash with the leftovers. This took about 2 and 1/2 charm packs plus about 1 yard of bone Kona. And I really wanted to set this on point...but I was facing a little bit different construction and quilting situation for this, so I decided to play it safe and just do the horizontal block layout. Smartest decision I have ever made! Let me just say that I have never attempted to finish a quilt using only my home sewing machine. I am now in awe of people who do it all the time. It was a tiny bit more difficult than I had imagined it would be. Since I didn't have my usual sewing set up, I had to improvise a little. 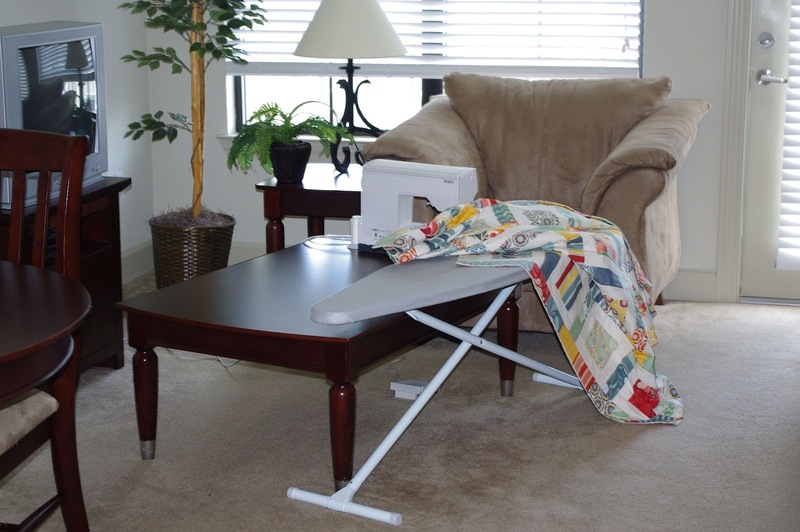 To give myself lots of extra room to wrestle with the quilt as I sewed it, I set up the machine on the coffee table and positioned the ironing board so it was right up next to my sewing machine. It worked like a charm...with surprisingly minimal back pain! Sometimes I think I am so clever! 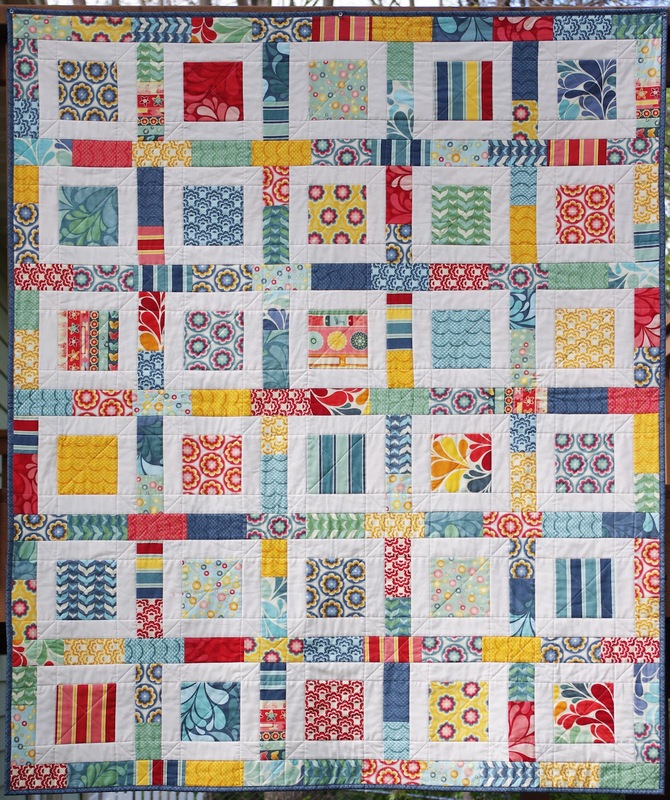 Once I had all the block rows and sashing rows sewn together, I went back and quilted a few more straight lines along all the seams (in the ditch) and then diagonally across the quilt in both directions. 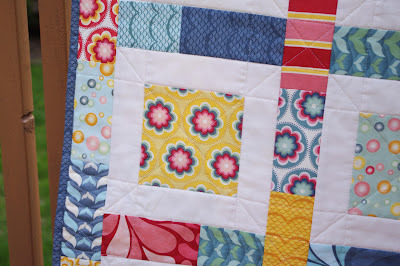 I really wanted to make the quilting frilly and fun, but I so did not have the skills to make that happen! I decided to just leave it, thinking I'd throw it on the quilting machine and add some other quilting when I got home. But once I got it home and tried to figure out what else to add to it, I decided it would be more trouble than it was worth. So it will stay as it is...a banner to my first (and hopefully last) attempt at quilting on my sewing machine! I used this pretty pretty feathery print for the backing...I love it! 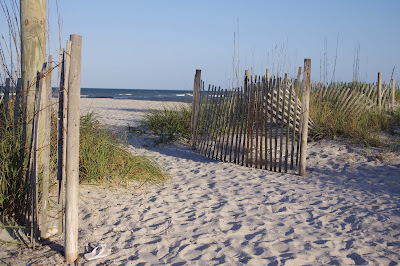 Once it was all done, we went back to the beach and I took a boatload of pictures. They turned out exactly how I had imagined it! And the lucky recipient of this quilt is my mom...who recently re-decorated her living room and could use a quilt with red accents...let's just hope it's the right red and that it matches (If not, Mom, you know what to do)! There is now a pattern for this quilt!! Get it HERE! Hi! I am fan of your work ... The fabric you chose this model is just the one I have for my next project, but waiting for me to come over since I live in Argentina .. The turquoise and blues do give it a beach feel and the bright colors and stripes give you the feel of colorful beach striped awning or beach toys. I still love your four mini quilts in your sewing room. How do you figure out how much fabric to buy for projects like that? As usual, I love your design and color choices, so clean and cheerful. 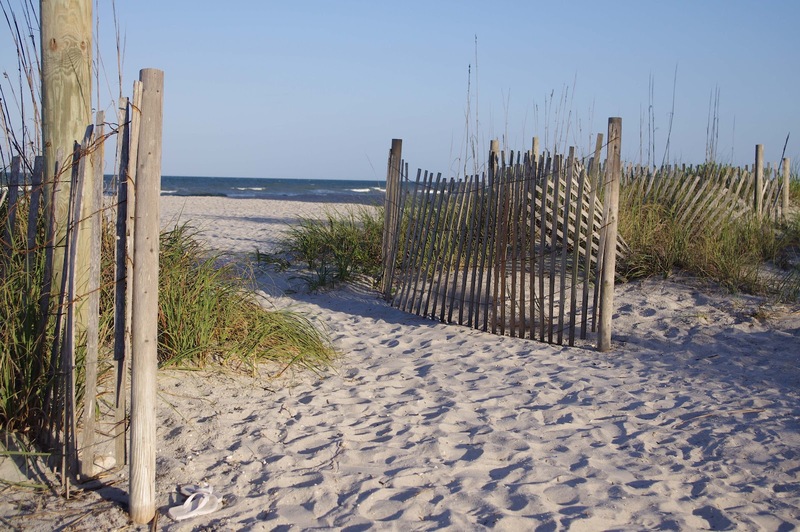 The beach setting is perfect for your photos. I think the quilt turned out beautiful! 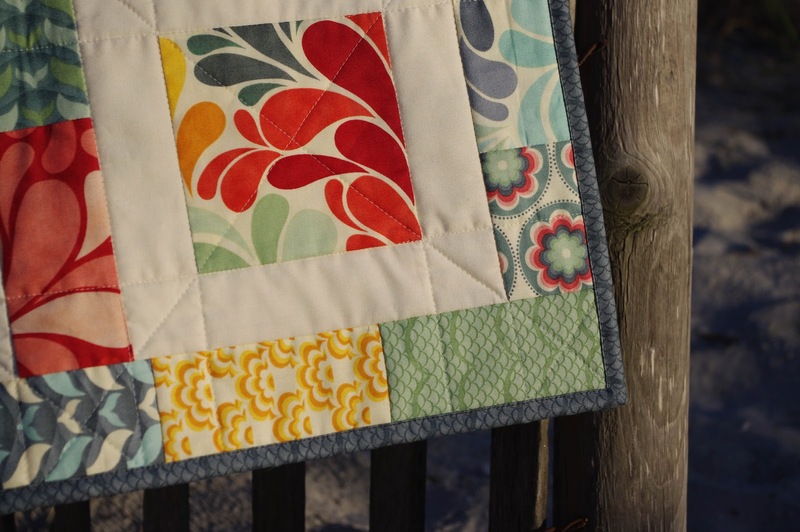 How brave are you getting fabrics inspired by a crooked fence?! AND sewing in the circumstances you did, I just lift my invisible hat before you! :) The fabrics by the way look great and the square in a square design is just perfect! 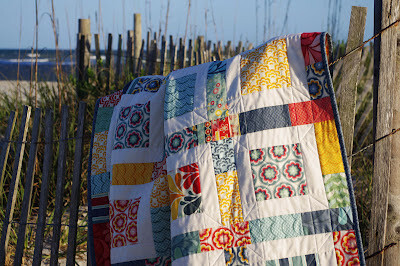 Pretty quilt and gorgeous setting for the photo! Cynthia, I love this! 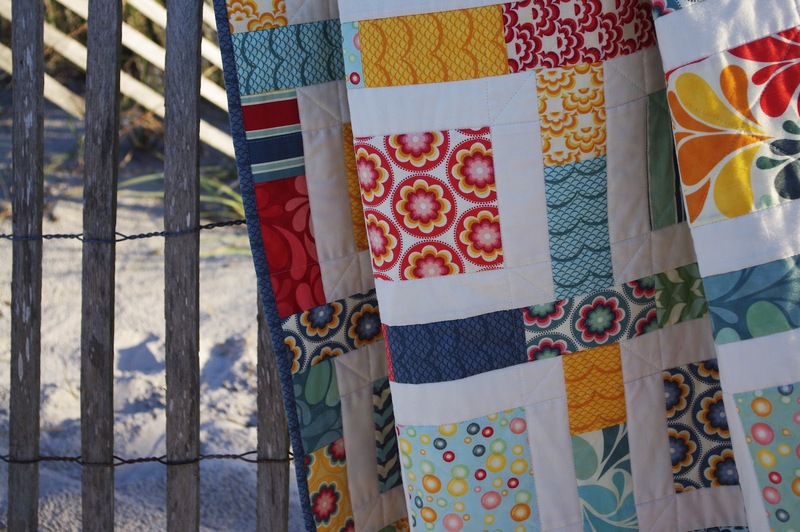 Your "quickie" quilt is gorgeous and the setting for the photo is fabulously perfect! I loved reading how this quilt and it's photo all came about. I would have "wanted" to do all that, but I'm sure I never would have. But you did! AWESOME! Love this! Beautiful quilt showing off gorgeous fabric. Really love the beach photos too! Wow, this quilt is gorgeous! I love how you quilted it. I really like that fabric line, the colors and patterns are amazing. Oh my goodness! I love this! Your design fits perfectly with the "Salt Air" theme. 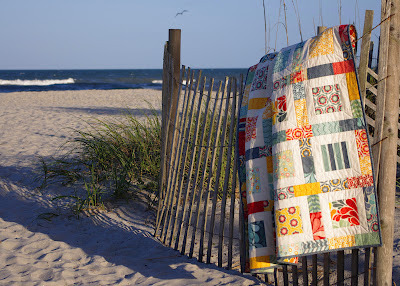 I love the beach and I feel that this quilt captures the mood perfectly. I love that you are so adventurous with your quilting! You should contact the fabric designer because I'm sure your quilt will help her sell her line! Love the design you chose. You needed to keep the pieces big enough to show off the fabric .I think it came out justr perfect. I really love the fabric and the backing....ooohhh yes. Great job. I am sure your Mom is gonna love it. I love that fabric line, and such an appropriate setting! Beautiful, thanks for sharing it. 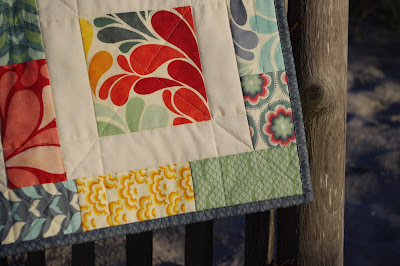 I just love this post - and the quilt! Hope mom loved it. What a great holiday! Beautiful quilt! Perfect setting to photograph it, too! What a beautiful quilt and love seeing Salt Air by the ocean! I use a 15-91 Singer domestic to quilt all of my quilts. I love this block layout. I there a pattern for it, or is it something you came up with? 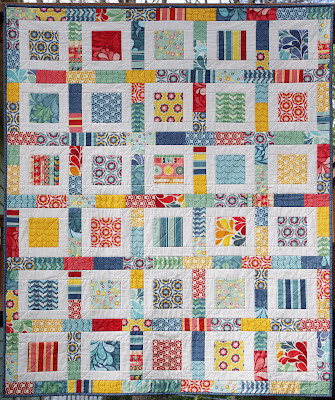 I stumbled across this quilt on Pintrest and LOVE it! 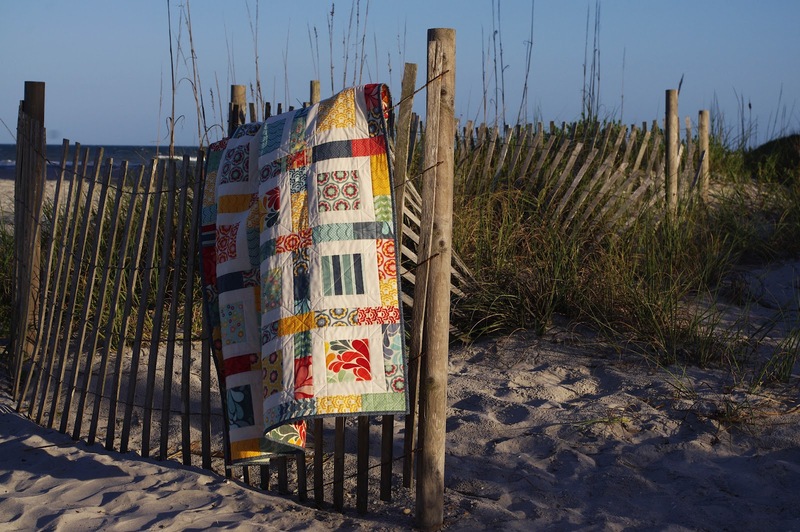 I was meant to live at the beach, your quilt PERFECTLY captures the feeling! With your blessing I'd like to make a similar quilt for myself. It looks like it's a lap quilt (about 50x60?). Could you tell me what dimensions the quilt ended up, and if you recall how much fabric was needed for the backing & binding? Personally I am notorious for overbuying fabric when I have to guess how much is needed. Just ask the recipients of the second California king quilt or the "largest baby blanket in the world" both made from the remaining fabric I had from my first quilt. That's right I made 2 extra quilts and I still have more fabric leftover. Do you have a pattern for this quilt? 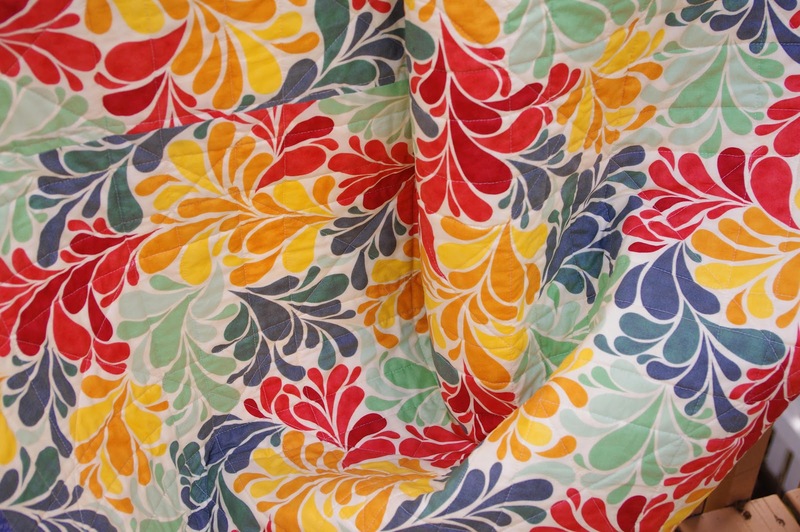 I did a quilt with this fabric as well. I used the same fabric for the backing! It's so yummy, isn't it? Hi! I'm Cynthia. 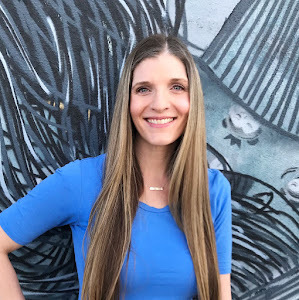 I love to make quilts and design quilts and talk about quilts...I am so glad you're here! Check out my quilt gallery for inspiration! All text and images © 2010-2016 Cynthia Muir. Powered by Blogger.